Stefani Joanne Angelina Germanotta, known professionally as Lady Gaga, is an American singer, songwriter, and actress. Again, like Cher, Gaga has been known for her outlandish costumes and her previously ever-changing hair. Although Gaga, like Cyrus, has tamed her look back considerably is rocking the old-Hollywood glamour look she, unfortunately, made some questionable fashion decision. 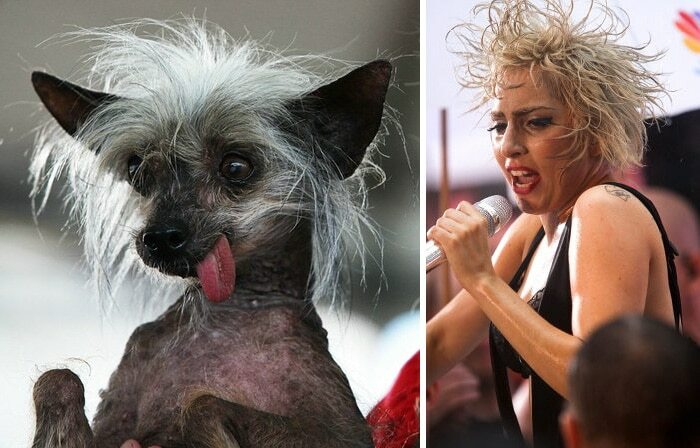 Unfortunately, this picture of Gaga is not only unflattering, but she looks simultaneously dirty, miserable and cold, which is exactly how we would describe this dog, who looks more like a naked mole rat than anything else.